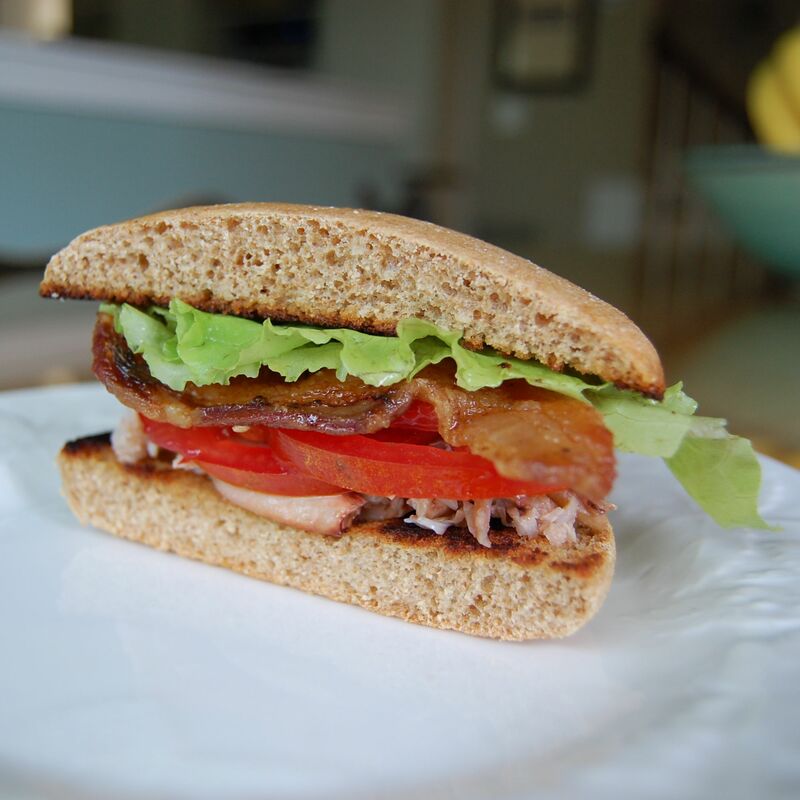 Here is a recipe that offers a little twist on the classic BLT sandwich…if you so desire. With some fresh locally grown or homegrown tomatoes you cannot go wrong whether you decide to include the crabmeat or not. I do admit this is not an entrée my kids will dig into, but they do like bacon and the bread so I just gave them some of that along with a few other kid-friendly items. Fry the bacon on both sides over medium-high heat until crisp, about 5 - 10 minutes. Using tongs, transfer to paper towels to drain. If using tarragon finely chop it and mix into mayonnaise. Evenly divide and spread the mayo mixture onto the lightly toasted buns. Top the buns with crabmeat, tomatoes, bacon, and lettuce. Hi Lisa! Great blog! Where do you get your crab meat? Thanks! Earth Fare…I’ve found it is one of the best places for seafood in South Charlotte. What kind of mayo and bacon do you use? All the bacon I saw had sugar in it. We buy “uncured” bacon from our Farmer’s Market. It has no seasonings at all, and we flavor it ourselves with salt and pepper when cooking it. I think I’ve seen “uncured” bacon at Earth Fare before as well, but I have not read the ingredients label. In regards to the mayo I use Spectrum organic. What brand of bread do you use? I’m brand new to the real foods eating thing! I thought I saw somewhere that mayo is not ok to eat while doing the pledge, because store-bought mayo has over 5 ingredients. Do you make your own? I just tried this last night and it was a hit! My fiancÃ© loves bacon but we eat it all the time, so the crab was a really nice twist on an easy and delicious dinner. Thanks for the wonderful recipe! Did you use canned crab and if not how did you prepare? We like to substitute mashed avocado (with a little lemon, garlic, salt, and pepper) for mayo. Still get the creamy taste, but I actually like it better! 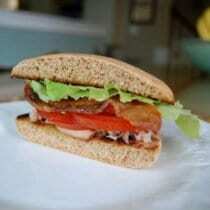 Why do your recipes not have calorie counts? I am trying to keep my daughter on a certain calorie count to help with her weight issues. I always use a little mayo (if you can make your own) with dill in it for this recipe. Yumm!